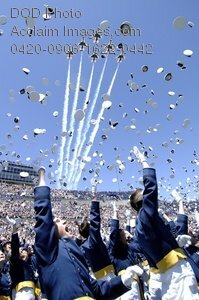 Description: Newly commissioned U.S. Air Force second lieutenants toss their hats into the air while F-16 Fighting Falcon aircraft from the Air Force Aerial Demonstration Squadron Thunderbirds fly over the U.S. Air Force Academy graduation in Colorado on May 27, 2009. DoD photo by Dennis Rogers, U.S. Air Force. Stock photography by Department of Defense Public Domain.